I was pleased to hear last week of acceptance of a paper proposal for ANZATS (Australia New Zealand Association Theological Schools) 2017 Adelaide conference. This paper is a joint paper, with David Tombs, public theologian at University of Otago. David did a seminar presentation last year and afterward we got chatting about some more systematic theological implications of his work. I had just returned from doing some work with some indigenous students, which had me thinking about the place of genealogy. 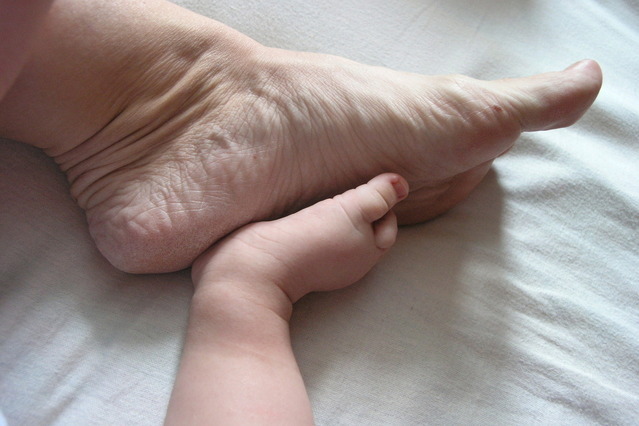 Much sexual violence occurs in contexts of kinship, including tragically the family of God. This paper tests notions of recapitulation when lines of kin are stained by sexual violence. Tombs has previously argued that Jesus is a victim of sexual abuse. How is this good news for victims in history? The genealogy of Matthew 1 connects Jesus with the royal line of David. It names women either sexually mistreated or vulnerable to sexual violence. Tamar is dishonoured by male sexual practices, resorting to prostitution. Bathsheba is sexually preyed upon by a powerful ruler. Rahab as a prostitute is likely to have experienced sexual mistreatment. Ruth’s vulnerability is evident in the encounter with Boaz. A further victim is anonymously present, given David is Tamar’s father, raped by Amnon. The Matthean genealogy thus locates Jesus as a descendant: of men who violate and of women violated. At stake is the depths to which redemption is possible. 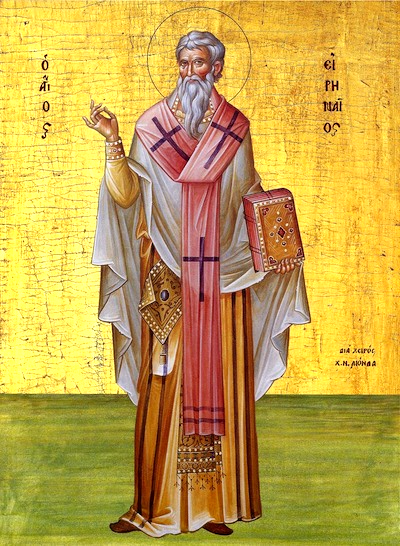 Irenaeus offers an essential link between theology and anthropology. For Behr, The Way to Nicaea (2001), these can be summarised as continual presence, making visible and full maturation. 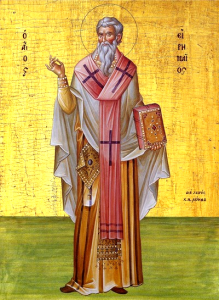 (See also Behr, Asceticism and Anthropology in Irenaeus and Clement , (2000)). These ground redemption in humanity experience. Jesus makes sexual violence visible when framed as from the Davidic line. In full maturity, Jesus acts justly toward victims of sexual violence. Gospel episodes of compassion, vulnerability and solidarity become a recapitulation, a contrast to actions of the males in the line of David. What emerges are starting points for ways to respond to sexual violence, including solidarity, visibility, acting humanly and tending bodies broken. The acceptance of this paper Sexual violence in the line of David: The possibilities and limits of recapitulation will mean I’m making two contributions to ANZATS 2017. I have already had a poster accepted on Structuring Flipped learning: The use of Blooms taxonomy in the classroom experience for the stream of stream on Learning and Teaching Theology. If I’m going to cross the ditch, I want to maximise the time, hence the submission of two proposals! We inhabit a geographic region in which for many cultures, genealogy is essential to knowledge. Given that Matthew begins the story of Jesus with genealogy, what are the implications for mission? Three missiology texts are examined – The Biblical Foundations for Mission , Transforming Mission: Paradigm Shifts in Theology of Mission and The Mission of God: Unlocking the Bible’s Grand Narrative – to understand how they conceive Matthew’s genealogy. Genealogy is then considered in two indigenous texts, one located in Aotearoa New Zealand (Tangata Whenua: A History ), the other in Australia (Colonial Contexts and Postcolonial Theologies: Storyweaving in the Asia-Pacific ). Both demonstrate how genealogy functions as an essential way of knowing, in which ancient memory is structured to clarify relationship with people and place. The implications of genealogy for missiology are tested, through teaching mission in one indigenous context. This clarifies the vitality of Matthew’s genealogy in framing mission as an ancestor story, a structured transmission in which God as the primary actor is weaving ordinary and indigenous people into the Messiah’s story. To interview participants at the Bothwell Spin and Fibre Festival (BSFF), Tasmania. 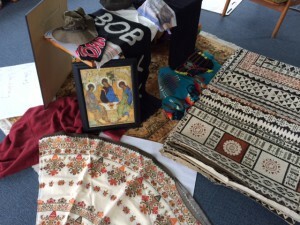 Members of the Uniting Church began this bi-annual community festival and continue to be active participants, including a blessing of the fleece liturgy, the providing of wool for festival participants to craft during the Festival and the holding of a Church service on Sunday as the Festival concludes. The festival has grown over the years, attracting international attention. It is considered a success both by the community and by the church. This project will explore the meanings attached to this event. It will consider a set of ecclesial foci: Why is the church involved, in particular in the gift of liturgy and craft? What specific theologies shape their involvement? Have those theologies changed over time? It will consider a set of community foci: What does the community think of the involvement of the church? How do they respond to the gifts being offered? What meanings are attached? How do these two foci connect with theorising regarding the secularisation thesis, which predicts that in modern society, religious participation will decline and religious institutions will weaken. There is widespread literature noting the decline of religious participation and institutions in Western society. This is loosely organised around a secularising thesis, which is generally posited to be more advanced in modernity, and thus by implication in urban areas. The BSFF is a rural event. A festival is a fluid event, interleaving together a range of interests, behind which lie a range of narratives. Research of the BSFF can be theorised in relation to the secularisation thesis, given it is located in a rural context and runs as a festival. Charles Taylor (A Secular Age , 2007) argues that in a secular age, festivals will be conducted in ways that eliminate the tension between the demands of everyday life and hopes of eternal benefit, most commonly by dropping the expectations of eternity and instead framing ultimate purpose as this worldly. Paul Heelas (Spiritualities of Life: New Age Romanticism and Consumptive Capitalism , 2008) argues for the rise of spirituality practised not by discipline, nor by ecstatic experience but through the practices of everyday life. This resonates with the work of Taylor and provides a framework by which to analyse the data. This research will test the secularisation thesis in regard to the narratives constructed around the participation of the church. Why might the church might be involved? 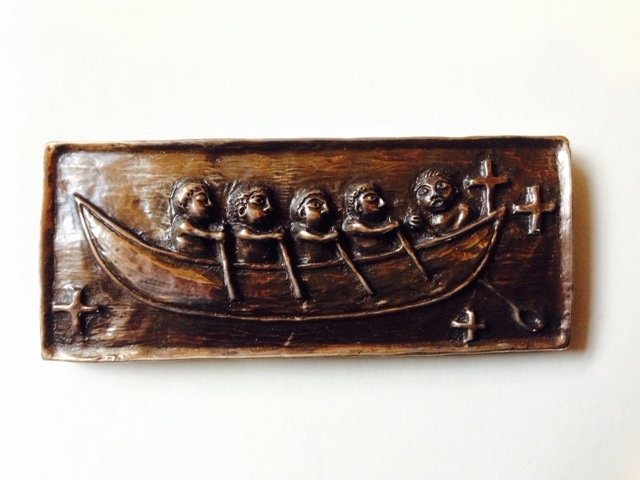 Does their involvement, and in particular their focus on craft, promote a spirituality that is this-worldly? 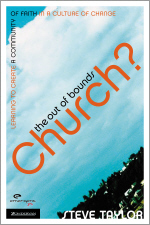 How do participants understand their involvement and the involvement of the church? The research thus has implications for understanding the motivations behind the general social benefits attributed to festivals. 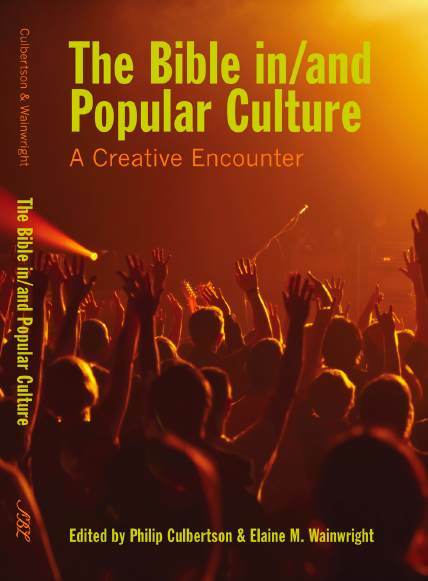 It provides understanding of how the church positions itself within a community and how community participate in such events. I spent a good part of yesterday in lecture preparation. I am teaching this weekend at Te Aka Puaho, working with Maori ministers in training. My topic is mission and I spent the bulk of my time in Matthew 1: the genealogy of Jesus. While I’ve never heard it used in mission, it is how Matthew begins the story of Jesus: with a genealogy. For indigenous cultures, with a strong sense of ancestors, genealogy is essential for identity. 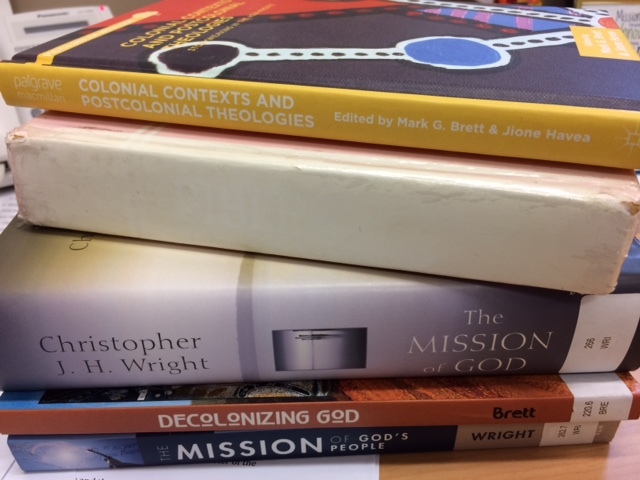 Deep mission – drawing on Mark Yettica-Paulson and his wonderful chapter “Mission in the Great South Land: An Indigenous Perspective” in Colonial Contexts and Postcolonial Theologies: Storyweaving in the Asia-Pacific (Postcolonialism and Religions) . Mission includes – and the four Canaanite woman – Tamar (Canaanite), Rahab (Canaanite), Ruth (Moabite) and Bathsheba (Hittite) – woven into Jesus bloodlines. Jesus has indigenous blood, those of Canaanite people. Mission surprises – and the importance of ordinary, everyday, quiet actions by people that no-one notices. It was a rich exploration, noting the absences, even in books like Christopher Wright’s The Mission of God: Unlocking the Bible’s Grand Narrative . When it comes to mission we face two temptations. One is to romanticize, to name all the positive things. The other is to recount all the negative and harmful impacts. The genealogy of Jesus offers a third approach. It begins with deep memory and a story of voyaging. It weaves indigenous cultures into the story. It tells the truth, refusing to romanticize, helping us see the courage of those marginalized by society. Hospitality as mission: Why does the church see itself as host not guest? I was asked to speak at a local Presbyterian church, to finish a month long series on hospitality. Being the last in the series, I offered to speak on hospitality as eschatology – looking at the book of Revelation, in particular Revelation 19:6-9. I also drew on Rublevs icon in what became an exploration of hospitality as mission. I runga i te ingoa, O te Matua, O te Tama, Me te Wairua Tapu, Amine. May I speak in the name of the Creator, the Redeemer, the Maker of all things new. A story to start. St Paul’s Chapel is the oldest surviving church building in Manhattan, New York. Built in 1766, it’s also the closest church to World Trade Centre twin towers. In the days following the destruction of 9/11, the church leaders met in emergency session. In the midst of such tragedy, they turned to Scripture. Where would you turn? Ask the person beside you. If you were the church next door to 9/11, where in the Bible would you turn in the days following? The church leaders turned to the stories of Jesus in the New Testament around food. In light of these stories – of Jesus around food – the church decided the best thing they could offer, as a church, post 9/11, was a gospel of hospitality. They resolved to be God’s presence by providing food for firefighters, for Police and rescue workers. Their 1766 church building had still not been checked for structural safety, so they set up bbq’s outside, serving burgers and offering lemonade. They appointed a Food captain. The Food captain, himself a local restaurant owner, sourced food from restuarants including the Waldorf Astoria, who arrived with a large delivery of chicken dinners. The church leaders continued to meet and pray. Ten days after 9/11, they made a third decision. To begin serving Eucharist, every day, at noon. Amid the food stations, the chicken from the Waldorf Astoria and the bbqs cooking burgers, an invitation was made to any present, not compulsory, to share around the table of Christ. The story is from Soul Banquets: How Meals Become Mission in the Local Congregation . It’s written by a lecturer in New Testament, who suddenly began to wonder if all the stories of Jesus in the New Testament around food might actually be saying something not just about then, but about now, not just about gospel then, but about church life today. The book did research on how churches are using food and the argument is made: that the church has underestimated the power of our church meals, both ritual and informal, as opportunities for mission. “Blessed are you who are invited to the wedding supper of the Lamb! These are the true words of God.” Revelation 19:9. Revelation is often the domain of crazies and cults. That’s not the intention of the original writer John. Writing, in exile in Patmos, as it says in Revelation 1:4. He’s not writing endtime prophecy for those obsessed with the Middle East. He’s writing to seven churches in Asia, to people living in mess, ambiguity and brokenness; to people persecuted by an Emperor, to a church under extreme stress. He responds by blessing these people; blessing them as invited to the wedding supper of the Lamb. It’s quite an unusual image for heaven. Quite different from streets paved with gold and fluffly clouds. “Blessed are you who are invited to the wedding supper of the Lamb! These are the true words of God.” Endtime prophecy? Domain of crazies and cults? Or an insight into how to live in times of mess, ambiguity and brokenness. 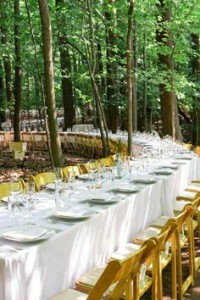 That eating, what you do at a wedding, is social activity. It’s what we do with friends and family. That eating, what you do at a wedding, is a relational activity. It’s where we share stories, remember our past, trace our whakapapa, and share our joy, name our sorrow. That eating, what you do at a wedding, is a messy activity. It has food scraps for the compost and red wine spilt on table clothes and dishes to wash.
That eating, what you do at a wedding, is an invitational activity. It’s the place where we build relationships. On the marae, the powhiri moves to the cupatea and the final meal moves into the poroporoaki. The writer of John, in using the wedding feast, is inviting those who live in mess, ambiguity and brokenness, to maintain the social shape of salvation. Interestingly, for all those who consider Revelation is about endtimes, is how much the writer, John, is looking back not forward. He’s looking back to the Bible’s first mention, ever, of eating, in Genesis 3; and offering new story, not to broken relationships in the Garden of Eden, but of relationships celebrated in wedding feast. He’s looking back to Abraham offering hospitality, killing a calf for three strangers. He’s looking back to the Mosaic Law in Leviticus. Where the mark of being the OT people of God was feasting. Five feasts – Passover, Unleavened Bread, Firstfruits, Trumpets, Tabernacles. And after the book of Esther, a sixth feast – Purim. Six cycles of celebration in which the alien and migrant is welcome. He’s looking back to the stories of Jesus in the New Testament around food – the Last Supper in Luke 22. In which Jesus said remember me. Remember what? Remember me with you at Levis banquet, remember me eating and drinking like a glutton, remember me feeding the 5,000; remember me telling you the Parable of the Rich fool and the Great banquet. And so “Blessed are you who are invited to the wedding supper of the Lamb,” is not an endtimes prophecy. It’s a looking back, a looking back which gives a social shape to those who live in mess, ambiguity and brokenness. Is it human nature, it’s easier to give than receive? Is it that dominant cultures are used to be at the centre, not the edge? Is it that we own buildings and somehow that turn us into hosts not guests? Why so often does the church see itself as host rather than guest, as inviting rather than invited? I’m intrigued by what happens in one interpretation of looking back, in Rublevs Icon, the story of Abraham and the oaks of Mamre. Painted in the 15th century by Russian monk called Andrei Rublev. Written to a people, living in mess, ambiguity and brokenness. In the background is the trees of Mamre, linking with Genesis 18:1. Three persons: linking to the three strangers in Genesis 18:2. Three persons – similarities – same halo, same blue colour, the colour for divinity; same holding a staff in the same right hand; same head slightly bowed looking at the person beside them. One is green is the colour of spring, the colour of things that grow. One person has brown, the colour of dirt. One person is gold, the beauty of God who created a beautiful earth. So in Rublevs icon, the host is not Abraham. The host is God, three persons of the Trinity – te Matua, te Tama, te Wairua Tapu; The Father in gold who created this beautiful earth; Jesus in brown walked in dirt; Spirit in green to help us grow. In the middle is the table. All tables have 4 sides. So there is plenty of room for the guest. So anyone can sit. Anyone who wants a relationship – conversation, participate in love, share in table fellowship with Jesus. So this is hospitality as mission. It’s when God, not church, is the host at the wedding banquet of the lamb. It’s when the Gospel has a social shape – participating in relationship with God. It’s when meals are at the centre; the cup, remember me – looking back – the stories of Jesus in the New Testament around food. I began with a story – St Paul’s Chapel in New York, in the 10 days after 9/11 – rescue workers .. drawn into the ancient prayers .. Christ’s church – beautiful – in all its messiness, diversity, ambiguity, brokenness .. .” I’ve placed that alongside the Bible reading: “Blessed are you who are invited to the wedding supper of the Lamb!” I’ve suggested that this is not endtimes prophecy, but a looking back – to Genesis and relationships broken and the hopes of the Old Testament that find their culmination in Jesus. And the challenge for us to see ourselves not as hosts, but as guests, in the God’s hospitality. So a story to end. It comes from Rebecca Huntley, who in her book, Eating between the lines, did research on the eating habits of contemporary Australians. She visits food courts and supermarkets and family dinner tables. She also visits the Spectrum Migrant Resource Centre in Melbourne, to attnd a lunch for migrant women. “the lunch I attended was messy, complicated, disjointed and at times frustrating. It was hard work, much harder than ordering Vietnamese take-away … It was a tiring experience, but much more satisfying .. Food was a conduit, a means of establishing real and potentially transformative relationships.” (Eating between the lines, 132). Set every church table in ways that reflect God’s abundance and creativity. When eating, find ways to encourage genuine conversation – questions on tables to encourage the sharing of lives. Never forget the church’s special meal – the stories of Jesus in the New Testament around food. I led a two day retreat for Wellington Ministers this week. The brief was fairly broad: to speak on something they’d not heard from me before. I decided to focus on “Give us this day our daily bread” and explore the spirituality of eating and the implications for ministry and mission. 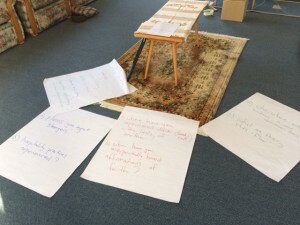 Each session involved a five step cycle, which I called “lectio vocatio” – listening to God and each other – amid a shared vocation as ministers. Application: Given the spirituality of “eating” in this Biblical story, what are the implications for ministry and mission? Where are the places in which you have met strangers? What are the practices of hospitality you have experienced? People had been invited to bring some cloth meaningful to them. These were laid on the table, as a way of making ourselves present in the circle of God’s love (in which our call to ministry begins). The diversity and colour was a rich reminder of particularity and uniqueness in ministry. Who are the “widows” in our community? What are their sticks and flour? People had been invited to bring a tin can. We reflected on where the “daily bread” we eat comes from and what we knew about the production and people. 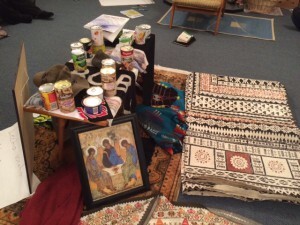 This became intercession, as we placed our tin cans prayerfully. Where have you experienced shelter (food and a roof) in the lands of another? When have you unexpectedly heard affirmations of faith? In ending, we cleared the table. As each person reclaimed their cloth and tin can, they shared an action they would like to engage, as a result of engaging together. The table was emptying, yet there was a renewed intentionality toward our ordinary tables of mission and ministry to which we were returning, grounded in a depth of contemplating (lectio) our vocations in ministry together. I very much enjoy this type of teaching. The theme provided a different way to reflect on ministry and mission. The movement between silence, Scripture, story and discussion felt empowering, yet provocative. The chance to build something over a number of days opened up every deeper layers of conversation. Key books in my preparation were: John Koenig, Soul Banquets: How Meals Become Mission in the Local Congregation and Rebecca Huntley, Eating Between the Lines and Anne Richards, Sense Making Faith: Body, Spirit, Journey . Welcome to the Fieldwork in theology forum. This forum focuses on the place of qualitative research in theology. The intention is to share fieldwork notes, the realities encountered in using qualitative research in theology. Why? The use of empirical methods in theological research is a growing trend in theology. Each year since 2012, there has been an annual Ecclesiology and Ethnography conference in Durham, UK. In 2012, Eerdmans launched two books: Explorations in Ecclesiology and Ethnography and Perspectives on Ecclesiology and Ethnography edited by Chris Scharen and Pete Ward. (I have reviewed these in the International Journal of Practical Theology and United Church Studies.) There have been sessions on Ecclesiology and Ethnography at AAR since 2012. In 2014, a new journal was launched – Ecclesial Practices journal, edited by Pete Ward, Paul Fiddes, Henk de Roest. So journal, books, conferences in UK and US all point to a growing trend in theology. Downunder, the most internationally recognised writing from Australia comes from Catholic theologian, Neil Ormerod. He wrote a chapter for The Routledge Companion to the Christian Church . At 684 pages, edited by Gerard Mannion and Lewis Mudge, The Routledge Companion to the Christian Church is one of the most impressive global summaries of contemporary ecclesiology. Ormerod’s chapter was titled “Ecclesiology and the Social Sciences”. He wrote of a “major divide in ecclesiology, between those who study … an idealist Platonic form in some noetic heaven, and those who study it more as a realist Aristotelian form, grounded in the empirical data of historical ecclesial communities.” The Routledge Companion to the Christian Church, Routledge: London and New York, 2008, 639-654. Ormerod’s downunder perspective gives us some definition. Fieldwork in theology is about a focus on ecclesiology not as idealized, but as grounded in the lived experience of historical ecclesial communities. The use of social sciences to clarify the shape of this lived experience of historical ecclesial communities. The belief that qualitative research is theological: faith seeking understanding at the intersection of grace and nature. All have undertaken fieldwork in theology, using qualitative research in pursuing theological questions. Second, their most vivid experience of using qualitative research in theology. Third, the most complex issue generated by your use of fieldwork in theology. The aim is not to present research results as such. Rather it is to explore methods, methodologies and theologies – the issues arising as fieldwork research is undertaken in theology. We will do this by using our discussion time not to ask specific questions of each paper, but rather construct a mind map, asking what are issues generated by the use of empirical research in theology. My hope is that this helps us focus on the realities of research and perhaps set a future research agenda. I’m crossing the ditch this week. First stop is Melbourne, where I am part of ANZATS (Australia New Zealand Association of Theological Schools). Second stop is holidays (more on that later). In Melbourne at ANZATS I’m doing a number of things. These include leading a Forum that I have initiated: Fieldwork in Theology: learnings down-under. This involves a panel of four (Dr Cronshaw, Dr Taylor, Lynne Taylor, Dr Ward). Each will address the question: first, their most vivid experience of using qualitative research in theology; second the most complex issue generated by their use of fieldwork in theology. The aim is to allow discussion of the issues arising as fieldwork research is undertaken in theology, in order to engage the topic focus: the place of qualitative research in theology. Third, I am presenting a conference paper. It emerges from my experiences on Walking on Country last year and ongoing conversation, digitally and by long-distance telephone call, with Denise Champion. Wanangha nai. Which means in Adnyamathanha, Where am I going? 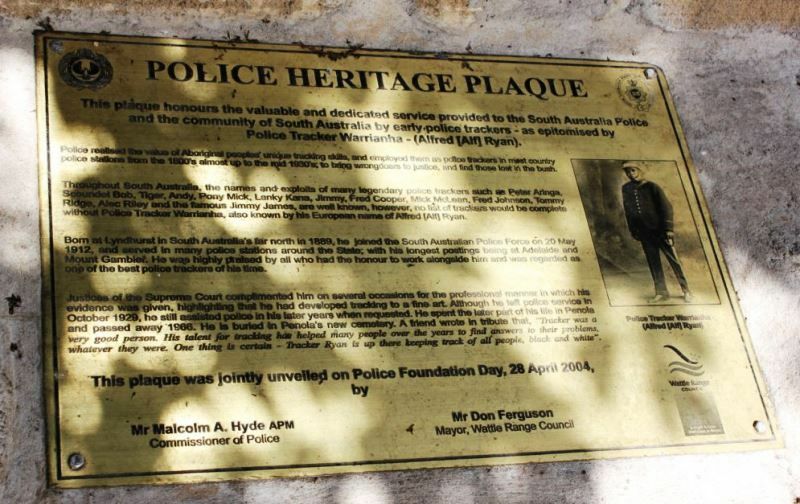 In this paper, where I am going is to share the story of Great Uncle Alf, honoured by the South Australian Police in 2004, who, I will argue embodies atonement: a knowledge of “this place” so deep that the lost are found and returned to home and community. To do that I need to provide a methodology, which I do through James McClendon’s notion of biography as theology: that by paying attention to lives, we find narratives that guide theology’s faithful evolution (Biography as Theology: How Life Stories Can Remake Today’s Theology ). And a Biblical conversation, which I do in conversation with Kenneth Bailey, who argues that Luke 15 draws from Psalm 23 and is an atonement theology in which what is lost is found and heaven rejoices (The Good Shepherd: A Thousand-Year Journey from Psalm 23 to the New Testament ). 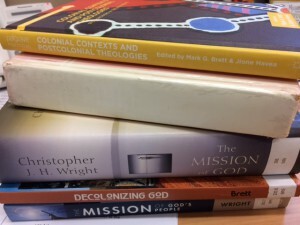 Wanangha nai: Where am I going in post-colonial missiology? First, Missio Dei – God is active in the world. Hence in cultures there are God-bearers, in whom God is Incarnate. Not fully. But enough that God is revealed and cultures and communities are dignified as God-bearers. Second, paying attention to “ordinary readers.” Gerard West, in the context of South Africa, argued that it was well past time for the academy to read Scripture not by educating the non-scholarly to read the Bible like the academy (Reading Other-wise: Socially Engaged Biblical Scholars Reading with Their Local Communities ). Rather by nurturing communities of “intuitive and critical interpreters …[who].. come to the biblical texts from different perspectives that are equally valid.” I will explore what that means among an indigenous community in South Australia. After 9 months immersed in Aotearoa New Zealand and the role at Knox Centre for Ministry and Leadership, I am really looking forward to stepping off the dance floor/crossing the ditch, to see friends, to say hello to Melbourne and to pick up some research threads that remain important to me and my mission journey while in Australia. Plant this movie: the International Urban Farming Documentary was on at the Rialto this Sunday morning. It was an inspirational watch. A few scenes moved me to tears, in particular the vision for culture change possible in decaying urban environments. 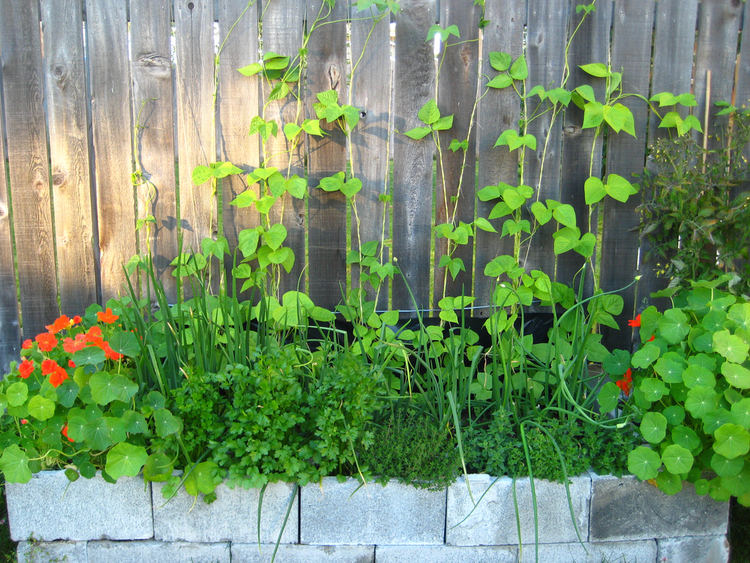 Gardens offer rich insight regarding how we might inhabit our neighbourhood. This paper considers gardens in Scripture, start, middle and end. 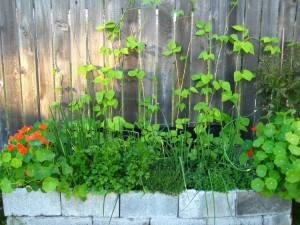 It researches the development patterns of two inner-city Australian community gardens. The story of each is brought into dialogue with Scripture, including Luke 10:1–12 and 1 Cor 3:6–9. The insights from this dialogue between Scripture and two urban garden case studies is then enriched by consideration of two movies. Gardening with Soul is a documentary about an urban missionary who turned the lawn of her religious community into a community garden. Grow your Own is the story of a stranger’s gift that grows healing among a well-established British allotment garden. Both point to the power and potential of a seasonal spirituality. Throughout this paper, beginning and end, is also woven experience—mine—into the place and potential of gardens in mission and ministry. The argument from Scripture, case study, film and experience is that gardens invite us and our neighbours to become good, plot by plot and plant by plant. My abstract for ANZATS 2016. The theme is atonement, which opens some space to reflect on indigenous Christology and develop a sermon I delivered at Port Augusta Uniting Aboriginal and Islander Christian Congress Minister last year. James McClendon (Biography as Theology: How Life Stories Can Remake Today’s Theology ) has argued that biography can remake theology. This methodology is applied to an indigenous Australian, to argue that a post-colonial atonement theology emerges in the biographical telling. 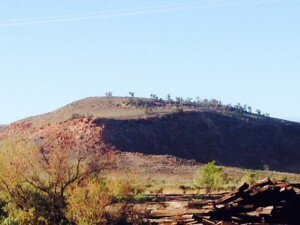 Warrianha (Alfred Ryan) was an Adnyamathanha man, born in the Flinders Ranges. 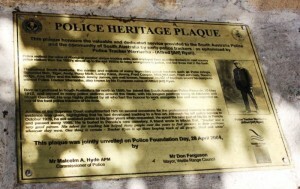 He was honoured in 2004 for his contribution over many years in the Coonawarra area as a Police tracker, renowned for his ability to find people. This provides a way to read Psalm 23, in which the Lord is the shepherd who, like an indigenous animal tracker, finds those lost in the valley of death. This suggests atonement as the experience of being found and returned to home and community. This reading of Psalm 23 is strengthened by the work of Kenneth Bailey (The Good Shepherd: A Thousand-Year Journey from Psalm 23 to the New Testament ), who listened to indigenous peoples in the Middle East. Bailey argues that Luke 15 draws from Psalm 23 and is an atonement theology in which what is lost is found and heaven rejoices. This provides another category by which to engage Indigenous Australian stories. Biography as theology, as in the life of Warrianha, is a different type of story in contrast to indigenous dreaming stories. Further, it is the story of working across cultures, among the Buandig nation, rather than among his Adnyamathanha people. McClendon’s conviction is that by paying attention to lives, we find narratives that guide theology’s faithful evolution. Warrianha’s life offers potential for those doing theology in a post-colonial age, as a place-specific indigenous Christology that crosses nations. Note: It is hoped that the presentation at ANZATS will be done in partnership with Warrianha’s great niece, Rev Denise Champion, Uniting Aboriginal and Islander Christian Congress Minister, Port Augusta, South Australia. I completed the Built for Change manuscript on Saturday. At 58,000 words and 11 chapters, it is a project I’m very pleased with. It is practical, filled with stories of change. It is probing, using Scripture, tradition and reason to respond to a range of important questions about fresh expressions innovation. 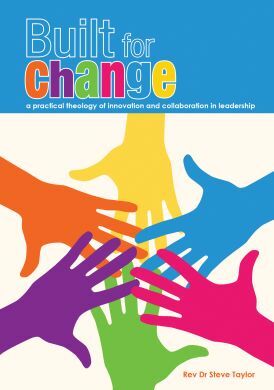 Is Jesus an innovator built for change? How to understand the old in light of the new? How might we connect modern insights into leadership with the Biblical tradition? It is personal, an in-depth look at how I lead myself in innovative processes. It has been very helpful in the transition from Principal Uniting College to Principal Knox College. At the same time, it has been demanding to write a book in what is essentially a 6 month period and I am very glad to have it behind me. Somehow completing it on Waitangi Day felt symbolic, another important step in the process of leaving Australia and earthing myself back in the richness of Aotearoa New Zealand. It is the last of the 27 pieces I wrote in Australia. I can stop “writing back reflectively” and start to think seriously about what it means to “write now” in this next season of my life. It is complete, but not finished. 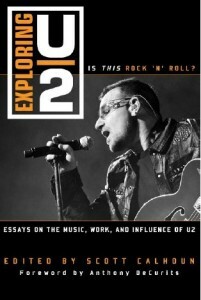 It now moves into the hands of editors, who work with me on making the book a better book. The publishing company (Mediacom) have a reputation for moving rapidly, so it could well be out by the middle of the year. Monthly I publish a film review for Touchstone (the New Zealand Methodist magazine). Stretching back to 2005, some 90 plus films later, here is the review for September 2015, of Australian film, Last Cab to Darwin. Last Cab to Darwin is a visual introduction to contemporary Australian stereotypes. Indigenous men drink and fight. White fella Australians drink and fumble emotionally. English women tourists are blondes willing to sleep around. Death strides into the midst of these caricatures. Rex (Michael Caton), a taxi driver from Broken Hill, is diagnosed with terminal cancer. With three months to live and afraid of hospitals, he hears of Dr Farmer (Jacki Weaver), advocating in the Northern Territory of Australia for the right to euthanise. Last Cab to Darwin is based on a true story, including the gaps in Australian law between Territory, State and Federal parliaments. It offers the potential to dwell in complexity. The reality is that the road trip genre becomes an excuse to speed past rich cultural complexity. Driving his cab to find Dr Farmer, Rex encounters Tilly (Mark Coles Smith), who proceeds to fight and drink his way with Rex toward Darwin. Their narrative journey is broken by a set of clichés, including watches that stop, feral cats hung from outback trees and Tilly’s salvation through sport, if he can beat the bottle. Speeding toward yet another stereotypical scene (Darwin sunsets), Tilly has a one night stand with English barmaid, Julie (Emma Hamilton), who wraps herself into their journey. These images, of indigenous men, white fella Australians and blonde English women tourists simplify the complexity that could ennoble Australia today. I refer to the lens through which the outback is viewed. The desert landscape depicted in Last Cab to Darwin is simply a dusty red backdrop through which visitors pass, collecting experiences on a road to somewhere. There is no sense of another story, of “anhangha idla ngukanandhakai,” the indigenous (Adnyamathanha) understanding of living in memory. This understanding of outback is beautifully depicted in the recently published Yarta Wandatha. It is a rarity, a theology book with colour photographs of outback landscape. Unlike Last Cab to Darwin, these scenes are never backdrop on a trip to somewhere. Rather, each is story, around which memory is wrapped. Interpreted in Yarta Wandatha by indigenous woman Denise Champion in creative dialogue with the Christian story, we find the unfolding of a very different outback story. Last Cab to Darwin introduces two indigenous women. Polly (Ningali Lawford) is Rex’s neighbor, having an affair they are both scared to make public. Sally (Leah Purcell) is Tilly’s wife. The movie provides stereotypical similarities of these indigenous woman. Both are abandoned by their menfolk. Both approach conflict by shouting angrily at those they love. Such is the simplicity of stereotype. In contrast, when Denise Champion tells the story of Awi-irtanha, the Rain Bird, we encounter a more complex story, in which indigenous resources, considered in light of Jesus, avoid the ugly consequences of unresolved conflict. Watching Last Cab to Darwin I kept waiting for the road trip to engage these stories on the road between Broken Hill and Darwin. The only hint is when Tilly locates Sally’s mob as fighters against colonial invasion. Once again, 40,000 years of rich and storied memory is lost, replaced by the stereotypes of recent arrival. Rev Dr Steve Taylor is becoming of Knox College for Ministry and Leadership, Dunedin. He is the author of The Out of Bounds Church? 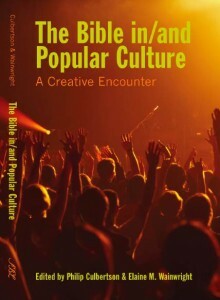 (Zondervan, 2005) and writes widely in areas of theology and popular culture, including regularly at www.emergentkiwi.org.nz. This was my old job – with a nice twist – church engagement! The last two applicants have been Kiwi’s. Third time ….? The successful applicant will have a unique skill set that should include experience in education and formation, leadership skills in mission, community mission experience, post-graduate qualifications and an ability to innovate within the faith and polity expressed in the Basis of Union of the Uniting Church in Australia. Applications close 5 pm, 8 September 2015, with interviews Wednesday September 23 and expected commencement at the beginning of Semester 1, 2016.